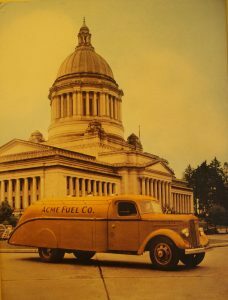 Acme Fuel is more than a historic building on State Avenue in Olympia. There are historic treasures inside the building too, namely, the Allen family, who have steadily built Acme Fuel with some old-fashioned guiding principles, generation by generation. On a recent cold afternoon, I had the pleasure of meeting Owner, Tom Allen Jr., his son Co-Owner and President, Christophe Allen and General Manager, Todd Deck. “I have just been very blessed, really.” says Tom, “We started off selling wood, then coal, then oil and then transitioned to propane. All with the same attitude – treat your customer right.” This philosophy is at the core of everything the Allen family has done over the past several decades, starting with Tom Allen Sr. He bought Acme back in 1940 as an employee of the company and began growing the business into what we see today. “He was just a great guy,” says Tom of his late father. “A typical, small town business man and he did things well. He was from an old Olympia family, they had been in business for years, timber, even oysters – the Tyee Oyster Company. He was old fashioned and he kept his word,” Tom recalls. Acme Fuel introduces the new General Motors delivery truck in 1935. Tom Jr. took over the family business after Tom Sr. became involved in politics in 1965, first as Finance Commissioner and then eight years as Olympia’s Mayor from 1968 – 1976. Tom Jr. stepped up to the challenge, anticipating and fulfilling the fuel needs for the community the past 50 years. 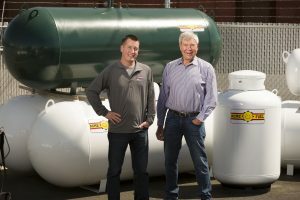 Tom Jr. opened the two Fast Fuel gas stations Acme currently operates and 22 years ago Acme started delivering propane and continues to deliver heating oil. 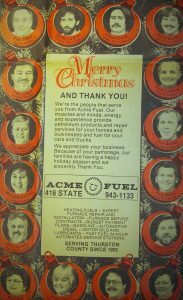 Regardless of the type of fuel the community needs, it is in the delivery and customer service that Acme shines. “A lot of people say they have 24/7 service,” says Christophe, “but what they mean is that it goes to an answering service. We really do have 24/7 service”. “A couple of years ago on the day before Thanksgiving” Todd recalls, “we were getting ready to close. We received a phone call from a new customer, “I have 25 people coming over for dinner and we just ran out of propane.” Our driver was getting ready to go home and I looked at him and he said ‘okay.’ He drove out to Yelm to fill her propane tank so she could cook her turkey on Thanksgiving Day.” Another exceptional Acme Fuel driver doing the right thing. For the record, when pressed, these stories come up again and again from Christophe and Todd. The difference is that those phone calls are not coming from current Acme Fuel customers. Inevitably, these are customers are with other companies that just aren’t providing that same level of service that Acme is happy to take care of. “Christophe and Tom are awesome to their employees,” says Todd, “and they treat them fairly, giving whatever is needed. Family comes first, we make sure to provide the time needed for our employees.” Todd has been working with Acme Fuel for over 10 years which, by Acme Fuel standards, makes him a bit of a newbie. “Cullen and I started on the same day 23 years ago,” recalls Christophe, “and Cullen’s Dad Don J. was a driver with us for 30 or so years.” Christophe and Todd begin fondly recalling those that have retired, “We had Dave for 35, Mary was here for 30 plus years, Don L. 30 years, Teresa was here for close to 20 years, Butch for 25.” They shake their heads in wonder. Though quite a few of the old guard have recently retired, many of the current staff seem ready to match their tenure. Todd starts ticking off names on his fingers, “Cullen has been here 23 years, let’s see Lonny is 11 years, Mike is 12 years and Jason 15. It just kind of continues. 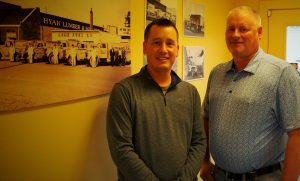 And now my son Jonny has been here for 3 years with us.” You can feel the pride these two men share in the dependability of their co-workers. With a track record like theirs, the Allen family and Acme Fuel are sure to be around for a while, treating people respectfully and helping out however they can. Call it old-fashioned if you want, some things are just better that way. You can visit their community involvement page to learn about the many foundations and organizations benefitting from Acme Fuel’s services and contributions.